This week I decided to play with moving paper mechanism instead of my usual pop-up card. The card depicts a lakeside sunset where a couple sharing the tranquility and beauty of the moment. First glance at the card where the couple are holding hands. Once the doily (tab) is pulled up, they lean towards each others shoulders and the sentence "Treasure each moment together" is revealed. My first attempt in creating an animation to demonstrate how the effect of the pull mechanism. Die Cut Diva's Challenge Blog "Holidays, You Say!" WOW! What a fabulous creation ... LOVE IT! Thanks so much for playing in our ‘THE GREAT OUTDOORS’ challenge at Dies R Us! Please come back again soon! WOW! Gorgeous card! I love the scene you created, the way they move when you pull the beautiful tab, and the additional message that is revealed. 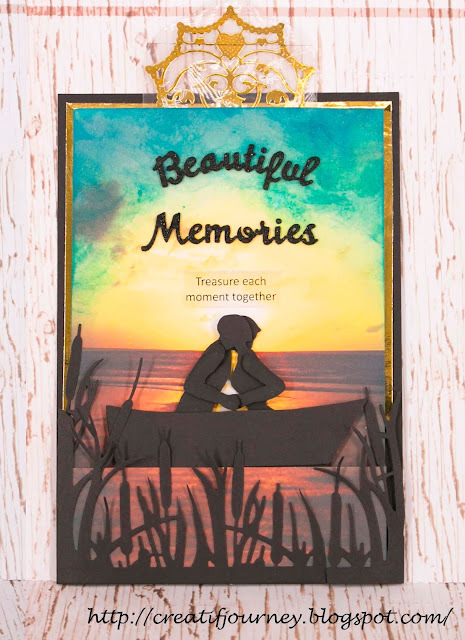 I enjoyed seeing your creation over at Die Cut Divas! How creative and gorgeous....love the technique!! Thank you for joining us at Dies R Us for our The Great Outdoors challenge! I must congratulate you on this wonderful and unique card design. I love outdoor scenes and this is certainly so cleverly done by taking portions of dies and making them fit your idea. This is really beautiful and the fact it is a motion type card is even more wonderful. WOW, this is just amazing and so beautiful!!! Love motion cards, and this one is super special! Thank you so much for playing along with our challenge this week at Cheery Lynn Designs and good luck! Oh, this is very cool, such a fun technique and a great choice of dies. Good luck and thanks for joining in on the fun at Cheery Lynn Designs challenge. An amazing interactive card !